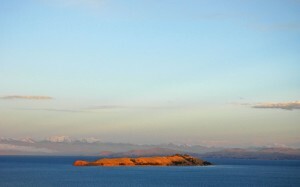 Lake Titicaca: Island of the Moon, Apu Ancohuma in background. Photo J. E. Williams, 2008. Considered the origin of human civilization by the ancient Incas, Lake Titicaca is a 3,200-square-mile lake that borders Peru and Bolivia at an elevation of over 12,467 feet on the Andean Plateau. Lake Titicaca and its watershed support thousands of indigenous communities that are based on traditional farming and fishing practices. Unfortunately, Lake Titicaca’s precious and sacred resources are spurring dramatic urban development and population increases within its watershed. This urbanization is jeopardizing the health of Lake Titicaca and all the indigenous people who rely on it for their livelihood. Lake Titicaca faces an array of threats—from urbanization and climate change to pollution, and overuse of its resources. 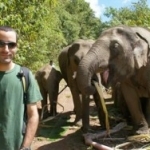 The threats also include water loss from evaporation and glacial melt due to warmer temperatures; water stress from overfishing, salt and mineral extraction, human consumption, and a growing tourist industry; as well as ecosystem and habitat loss. The largest city in the Lake Titicaca region is El Alto, which is home to 1 million people, mostly low-income Aymara Indians. The Aymara people migrate from the countryside to El Alto in search of employment and educational opportunities. Unfortunately, the city of El Alto has inadequate wastewater treatment facilities and is unable to provide clean water to its homes and businesses. Because the municipality has only one wastewater facility, the rest of the untreated wastewater is pumped into the rivers that empty into Lake Titicaca. The result is major public health and sanitation problems for millions of people. Additional wastewater treatment plants are needed in El Alto to battle this water pollution crisis; and in order to achieve this, governmental and international assistance is required. Despite all the pollutants the city of El Alto sends toward Lake Titicaca, it is not the only contamination contributor. Rivers winding toward the lake pass smaller towns that also contribute human and industrial waste. Also, gold mining operations in Peru use a smelting process that releases mercury into the lake’s watershed; mercury is highly toxic to all living organisms, including humans. Furthermore, livestock grazing along the shore deposit waste into the lake. Consequently, this organic waste can trigger rapid aquatic plant growth, which in turn absorbs life-sustaining oxygen from the water as well as blocks sunlight that other plants and animals need to survive. Tourism presents another serious environmental challenge for Lake Titicaca, even as it provides improved incomes and infrastructure to the region. Eco-tourism and infrastructure in cities bordering the lake such as Puno, Peru and Copacabana, Bolivia must be planned carefully for government and non-governmental projects in order to avoid further damage to Titicaca. The dramatic population influxes both of these cities see from tourism lead to excess pollution that makes it way into the lake. Lake Titicaca provides fresh water and economic support from fishing, irrigation, agriculture, and tourism for both Bolivia and Peru. The loss of the lake as a viable ecosystem could result in debilitating economic consequences for both countries, and this could ignite land and resource conflicts between them for the remainder of the lake’s benefits. 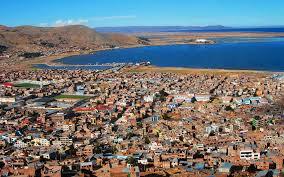 Climate change will also play a deciding role on the future survival of Lake Titicaca. Due to an increase in temperatures by 1.5 to 2 degrees Celsius (3.6 degrees Fahrenheit) from historic norms, Lake Titicaca is losing 2 to 3 centimeters (about 0.78 inches) of water per day. According to climatologists, Lake Titicaca will no longer be able to recover from water loss and will disappear between 2040-2050. As a result, the most serious impacts of climate change on Lake Titicaca will be endured over the next 30 to 40 years, and the end result, the loss of the world’s highest navigable lake, will change the region forever. 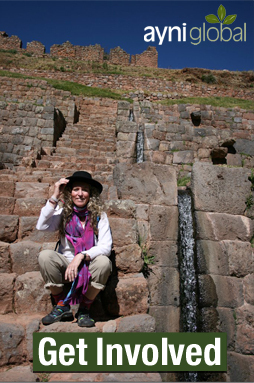 Lake Titicaca straddles Peru and Bolivia. Watershed Map: The Guardian, 2012. The World Bank has been monitoring the Lake Titicaca watershed basin since 2003 through land-use change analysis and mapping. The lake’s wetlands are very biodiverse and contain the Reserva Nacional del Lago Titicaca at Puno Bay, an area protected as a RAMSAR Convention on Wetlands endangered site because of its importance as a breeding ground for endemic species. These wetlands, along with the agricultural land surrounding the area, are being monitored to address environmental threats of soil erosion, land degradation and succession of water bodies by other types of land cover. 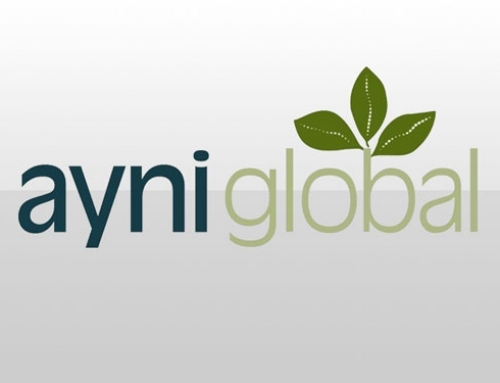 Satellite mapping revealed that while most of the crop production in Bolivia is located in areas surrounding Lake Titicaca, only 17 percent of the total area is suitable for agricultural use. The World Bank analysis revealed that increase in agricultural activities affects other vegetation and ecosystem types such as water bodies, rivers, wetlands and forests. In addition, land-use data shows evidence of rapidly receding water levels with an estimated loss of the shoreline up to 100 kilometers (about 62 miles), which is about 7 percent of the lake’s total area. 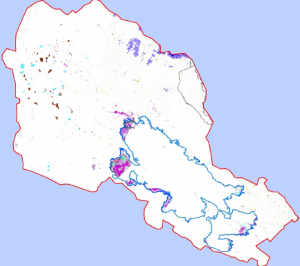 Lake Titicaca land use map shows expansion between 2003 and 2010. Credit: GAF and the World Bank. The World Bank’s data on the lake’s water quality has been useful in managing pollution hotspots caused by organic and other types of contamination. Information gathered for Lake Titicaca revealed that the most polluted areas located on the Peruvian side are within the Puno’s interior bay, the Torococha River, and the lower course of the Coata River. 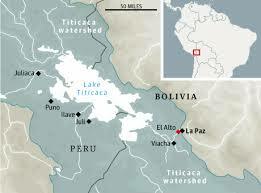 On the Bolivian side, the hotspots are within the Cohana Bay area, northwest of La Paz. Satellite-based analysis confirmed an increasing rate of pollution in Puno Bay due to the untreated sewage and agricultural runoff carrying fertilizers. 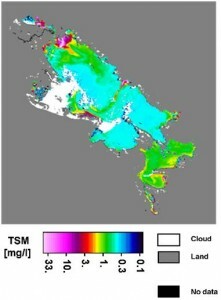 Lake Titicaca, Satellite MERIS: total suspended matter (TSM) concentration. Credit: Eoworld project, EOMAP for European Space Agency/World Bank. Fortunately, the international community is concerned about the future of Lake Titicaca and additional projects are in place to closely monitor its condition. In 2008, the European Space Agency commissioned a feasibility study for development of the Lake Titicaca Territorial Observatory to demonstrate the potential of Earth Observatory products for various lake monitoring and development tasks. Plan Jaguar was implemented in 2009 and defined steps for the creation of the Lake Titicaca Territorial Observatory.